The solution is simple to restart windows programs or processes with ProcessKO on ms desktop and server operating systems! Here are two options to restart programs. What is under Windows especially for program testers and bloggers who deal and write about software not so rare. When a program is not working properly and takes a long time, but you still want to complete the program test and restart the program easily and quickly to give a chance for a complete program test! You'll see a program restart is easy then ewer with this Free Windows Tool! 1.) ... Restart Programs from ProcesKO Window! 2.) ... Restart Programs via ProcesKO To-Tray Symbol! 3.) ... What should I consider when forced to close and start Windows programs? See also: ► Add Windows programs to Favorites KO-s! 1.) 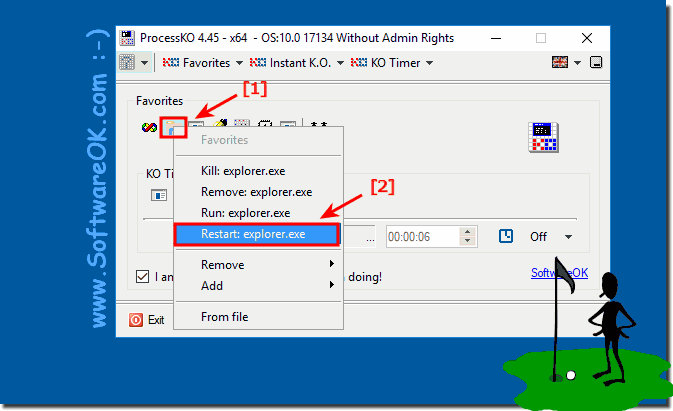 Restart Programs from ProcessKO Window! Please use right mouse click on Favorites K.O. to restart windows processes or programs! in example restart the Windows MS-Explorer (... see Image-1 Arrow-1)! The screenshot has been made under Windows 10 Redstone, but it works in all Microsoft Windows Desktop and Server 2016 to 2000 operating systems! Tip: ... Keyboard shortcuts to re-start Windows programs! (Image-1) Restart windows programs or processes with ProcessKO! 2.) Restart Programs via ProcessKO To-Tray Symbol! (Image-2) Restart programs via ProcessKO To-Tray! 3.) What should I consider when forced to close and start Windows programs? As with the Task-kill command, it is also possible in ProcessKO to schedule almost all programs, so it is important to be aware of what you are doing and what Windows program, process or application you are completing to use the program correctly if you, for example, Word or Excel from the MS Office 365/2016 package Terminate unsaved documents or the last changed content is lost. Tip: Wild scheduling of the programs is not recommended without the necessary Windows knowledge! ►► Use Taskkill with the Cmd.exe correctly and sensibly with examples? Any suggestions for the program ProcessKO, or how they could use better? At the top of the page is the contact link! 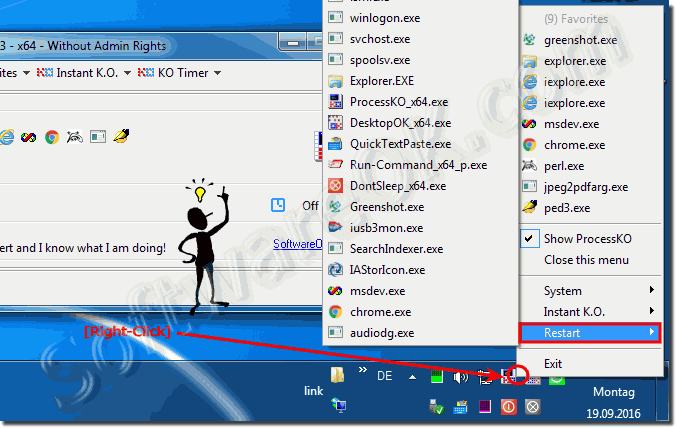 ProcessKO - FAQ-3: How to restart windows programs or processes with ProcessKO? Kill multiple programs with one shortcut in Windows 10? You'll see a program restart is easy then ewer with this Windows Tool on your desktop with a little rascal?